This weekend we celebrate the 85th birthday of Dr. Martin Luther King, Jr. Dr. King has become one of America’s most revered figures, and it is fitting that we honor his memory each year at the anniversary of his birth. Our nation is a better place because of his witness to justice and freedom. Time has a tendency to transform and even obscure messages. Whereas Dr. King was considered by many in the Euro-American community to be a radical, he was in many ways a moderating voice. A person like Malcolm X was, at least until the later part of his life, was a much more assertive presence. It is likely that taken together, the two men, both cut down in the prime of life by assassin’s bullets, pushed America toward recognizing that freedom and justice were not available to all its citizens. Unfortunately, many Americans, believe that we have achieved full equality. But such is not the case. Even today, being white (which is my coloration) is a greater predictor for success in life. This is called White Privilege. Many who share my coloration don’t want to admit that these benefits exist, suggesting that we are now a post-racial society (after all, we elected a Black President). Yes, there have been advancements, and there are many more protections in place, but people of color still face an uphill battle when it comes to gaining true equality in this country. The question that we face in our day is whether we’re willing to push beyond the status quo and work toward true equality and true freedom. 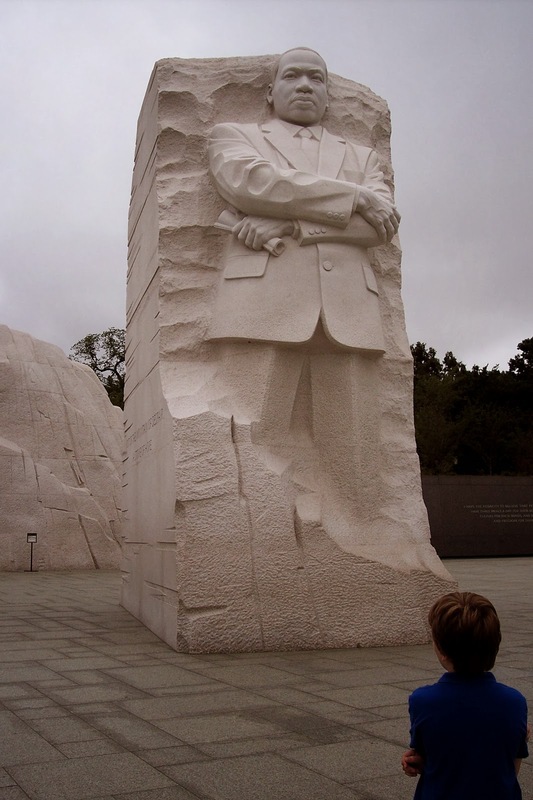 If we’re to take up this calling, then we’ll have to continue heeding the message that Dr. King’s enunciated fifty years ago, when he addressed the people of America from the steps of the Lincoln Memorial. On that day he spoke of a time when people would be judged by their character, rather than the color of their skin. It is a wonderful image, but unfortunately it has too often been misunderstood. We hear a lot about the need for “color-blindness.” I don’t believe that this is what Dr. King had in mind. To be color blind is to suffer from a mild disability that prevents one from distinguishing between certain colors. Instead of being color blind, I believe that Dr. King wanted us to celebrate our diversity, and affirm each other as being fully human in our diversity not in spite of it. He spoke against prejudging people on the basis of color, but he also called for the majority culture to give place to those who didn’t share that culture. The idea of ethnic color blindness is much akin to the idea of America being a Melting Pot. The problem with both analogies is that in the end the majority culture determines what is normative and what is not. If you don’t fit the norm, which in our country is European American, then you will find it difficult to successfully navigate this society. Your chances of success are determined by your ability to assimilate to the norm. But is this what makes America America? Is not our diversity of cultures and ethnicity our strength? Are not our lives enriched by this diversity? To name but one area of our lives, consider the foods we have at our disposal: Indian, Lebanese, Moroccan, Thai, Chinese, Japanese, Polish, German, Mexican, Brazilian, Cajun, Creole, Cuban, Ethiopian, and many more. I for one am thankful for this gift! As we celebrate the memory of Dr. King today, let us choose to embrace each other as we are and not require the other to be the same as me. Let us press on in our pursuit of the dream Dr. King proclaimed to the nation, so that there will be true freedom and true justice and true equality for all. When that occurs, then people will be judged by their character rather than the color of their skin.